Do you suffer from: Depression, Anxiety, Stress, Alcoholism, (ADD/ADHD), Drugs, Outbursts of Anger, Lack of Concentration, Overweight, PTSD, or Sleeping Problems? 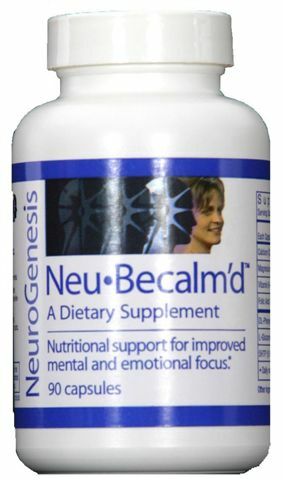 If so, Neu-Becalm'd products could be the solution you're looking for. Neu-Relieve™ is a special formula consisting of vitamins, minerals and amino acids designed to nutritionally support production of the neurotransmitters that are depleted by the long term use of tranquilizers. The brain chemistry involved in many forms of dependence (overeating, alcohol abuse, etc.) has been carefully described by qualified researchers for almost 30 years. Scientists have now concluded that the compulsive desire for excessive alcohol consumption in most instances has a genetic origin that is triggered by environmental factors. Neu-Replenish™ is formulated for the neurochemistry that is depleted of dopamine, norepinephrine, GABA and serotonin through the use of chemical stimulants. For those who are tapering from the excessive or prolonged use of prescription pain pills or are withdrawing from the use of opiate drugs such as heroin or methadone, The Neu-BeCalmd/Neu-Relieve Combo nutritional supplement pack provides the building blocks that allow the brain to supply the natural pain killing endorphins that it ceased to produce when the patient went on the prescription medications.